Thermal alerts detected by MODIS within the 2001-2002 period occurred only during August-October 2002 (figure 3) in the summit area. The first alert occurred on 13 August 2002 when a single alert-pixel had an alert ratio of -0.542. On 10 October the anomaly consisted of two alert-pixels with a maximum alert ratio of -0.409, and on 21 October the anomaly was characterized by six alert-pixels (clustered SW of the summit) with a maximum alert ratio of -0.571. Figure 3. MODIS-detected alerts on Arjuno-Welirang during May-December 2002. Thermal alerts collated by Diego Coppola and David Rothery; data courtesy of the Hawaii Institute of Geophysics and Planetology's MODIS Thermal Alert Team. The Volcanological Survey of Indonesia reported that the volcano was at Status Level I (no activity) in October 2002. No observations were reported, but only distant tectonic earthquakes were detected at the seismograph station. 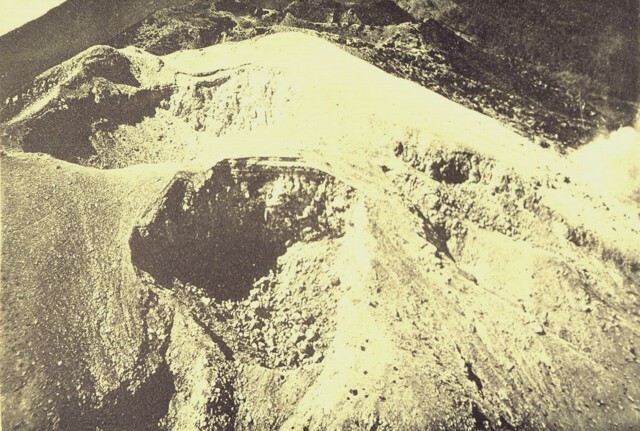 An explosive eruption took place in the NW part of Gunung Welirang in October 1950, and eruptive activity was reported on the NW flank (Kawah Plupuh) in August 1952. Steam plumes from the summit of Welirang were photographed from space on 13 September 1991 (BGVN 16:08) and in mid-November 1994. Information Contacts: Dali Ahmad, Volcanological Survey of Indonesia (VSI), Jalan Diponegoro No. 57, Bandung 40122, Indonesia (URL: http://www.vsi.esdm.go.id/); Diego Coppola and David A. Rothery, Department of Earth Sciences, The Open University, Milton Keynes, MK7 6AA, UK. Thermal alerts courtesy of the HIGP MODIS Thermal Alerts Team (URL: http://modis.higp.hawaii.edu/). The Global Volcanism Program has no Weekly Reports available for Arjuno-Welirang. A plume from the summit area of Welirang . . . was photographed by Space Shuttle astronauts on 13 September at  (photo no. S48-151-064) (figure 1). The dense portion of the apparently ash-poor plume extended roughly 50 km N and more diffuse material continued for another 65 km. The summit area was white and apparently de-vegetated. A plume was observed again on direct video downlink from the spacecraft on  September at . No ground reports were available at press time. Figure 1. Space Shuttle photograph showing a steam plume from Welirang (just east of the central cloud mass). Also, the lack of vegetation at the peak indicates volcanic activity. Volcanoes on Java form an E-W line of peaks the length of the island; five are in this image. NASA Photo ID: STS048-151-064, 13 September 1991. Information Contacts: C. Evans and D. Helms, NASA-SSEOP. A photograph taken from the Space Shuttle in mid-November 1994 showed a possible steam plume originating from the summit of Arjuno (figure 2). Figure 2. This is a striking, oblique view to the south of the Indonesian islands of Java (right), Bali and Lombok (upper left). The linear array of dark regions across the photo is a chain of volcanoes. 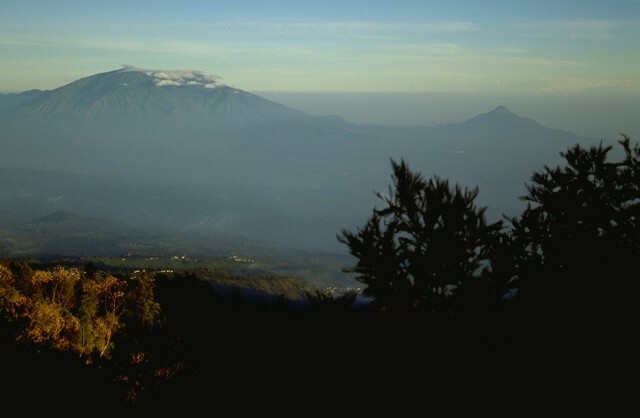 Plumes of steam can be seen rising from the summits of Arjuno (eastern Java, near the center of the photo) and Merapi (central Java, near the right of the photo). The region appears hazy due to an extended drought over Indonesia, New Guinea, and Australia resulting in huge fires and a regional smoke pall. NASA Photo ID: STS066-154-157. Approximate date: 14 November 1994. Information Contacts: NASA JSC Digital Image Collection (URL: http://images.jsc.nasa.gov/). The twin volcanoes of Arjuno and Welirang anchor the SE and NW ends, respectively, of a 6-km-long line of volcanic cones and craters. The Arjuno-Welirang complex overlies two older volcanoes, Gunung Ringgit to the east and Gunung Linting to the south. The summit areas of both volcanoes are unvegetated. Additional pyroclastic cones are located on the north flank of Gunung Welirang and along an E-W line cutting across the southern side of Gunung Arjuno that extends to the lower SE flank. Fumarolic areas with sulfur deposition occur at several locations on Gunung Welirang. This volcano is located within the Bromo Tengger Semeru-Arjuno, a UNESCO Biosphere Reserve property. Bronto S, Zaennudin A, Erfan R D, 1985. Geologic map of Arjuno-Welirang volcanoes, East Java. Volc Surv Indonesia, 1:70,000 map. There is no Deformation History data available for Arjuno-Welirang. There is no Emissions History data available for Arjuno-Welirang. The massive Arjuno-Welirang volcanic complex (left) and the smaller Gunung Penanggungan volcano (right) are seen from the SE across a broad valley from the summit of Tengger caldera. A chain of small cones and craters extends across the Arjuno-Welirang complex, while the flanks of the small Penanggungan stratovolcano are drapped with massive lava flows from satellitic vents. The twin volcanoes of Arjuno (right-center) and Welirang (left), seen here rising NE of cultivated land at their feet, anchor the SE and NW ends, respectively, of a 6-km-long line of volcanic cones and craters across a broad valley across from Tengger caldera. A line of pyroclastic cones cuts across the southern flank of Gunung Arjuno and extends to its eastern flank. Fumarolic areas with sulfur deposition occur at several locations on Gunung Welirang. 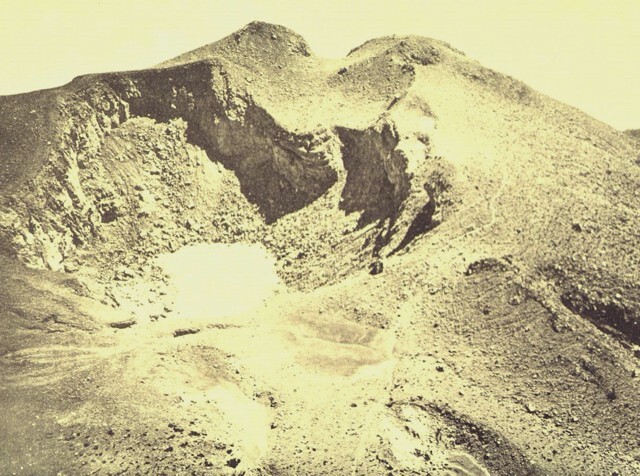 A complex cluster of craters caps the summit of Gunung Welirang. Kawah Jero crater (upper left) lies behind Tilas Geni crater in the foreground. Steam rises from Kawah Plupuh at the right. This view looks from the north to craters of Gunung Arjuno in the background. Kawah Jero crater is one of many cutting the summit of Gunung Welirang, the northernmost of the twin Arjuno-Welirang stratovolcanoes. A 6-km-long chain of volcanic cones and craters extends NW-SE between the volcanoes. 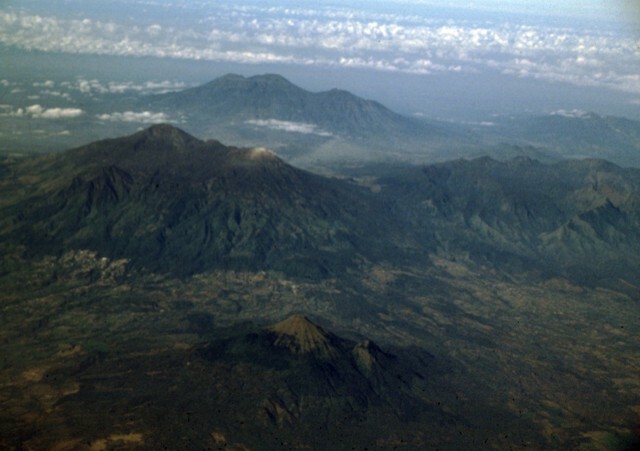 Three young volcanoes in eastern Java are seen in this aerial view from the NE. 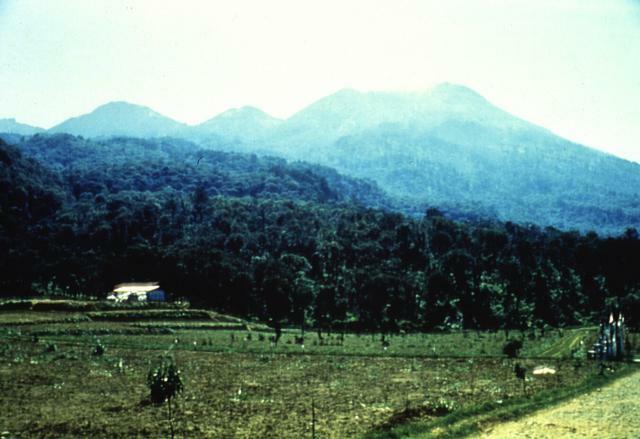 The Arjuno-Welirang massif lies at the left-center, with 3339-m-high Gunung Arjuno forming the high point of the complex and light-colored Gunung Welirang to the NW (right). In the background is the Kawi-Butak massif, with 2868-m-high Gunung Butak forming the high point and Gunung Kawi to its right. The smaller conical peak of Penanggungan rises above lowlands in the foreground. There are no samples for Arjuno-Welirang in the Smithsonian's NMNH Department of Mineral Sciences Rock and Ore collection. Large Eruptions of Arjuno-Welirang Information about large Quaternary eruptions (VEI >= 4) is cataloged in the Large Magnitude Explosive Volcanic Eruptions (LaMEVE) database of the Volcano Global Risk Identification and Analysis Project (VOGRIPA).